Color Trade Print offers Wholesale Inline Foil Business Cards. 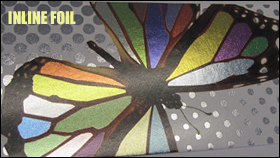 Inline Foil is great because it allows you to achieve full color foil accents in almost any color in the CMYK spectrum. With Inline Foil your brand message can really illuminate. You can add Inline Foil to your logo or anything according to your requirements. 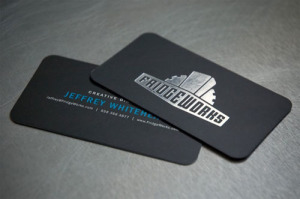 Your business cards can be created with any die cut shape, rounded, or with the standard pointed edge. We can laminate it with gloss, which will give it a shiny look. Or with Matte, which will give it a neutral look. We can customize your Inline Foil Business Card product according to your desired quantity and size. Here are a few examples of Wholesale Inline Foil Business Card designs, each representing a different style and purpose. 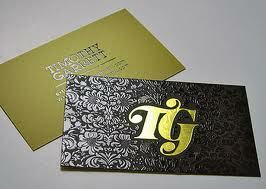 It is very important that you create your wholesale business card with the right inline foil color scheme. So if you would like to see these foil colors in person, we offer Inline Foil Swatches in our sample kits. If you would like a swatch or a sample pack simply fill out a request form. Please feel free to contact Color Trade Print and request a quote through email at http://www.colortradeprint.com/contact_us.html or by phone at . Please be specific about your size, quantity, and color scheme. Color Trade Print’s Representatives look forward to assisting you with your printing questions and orders.